“I came to Kyla for our wedding flowers with no theme, no design and no real idea of what I wanted. Kyla made the whole process so easy, she was so accomodating with my many many order changes and an absolute pleasure to work with. Everything from the bouquets & buttonholes, to the table centres and floral installations on our arbour & above our bridal table was coordinated by The White Orchid. I could not have been happier with how everything turned out. Our table centres were donated to a retirement village the next day and they brought a smile to many faces. Super happy to support this wonderful small SA business”, from Ashlea. It’s no secret, I love a good wedding and the wedding of Ashlea and Anthony was exactly that, a really good wedding. 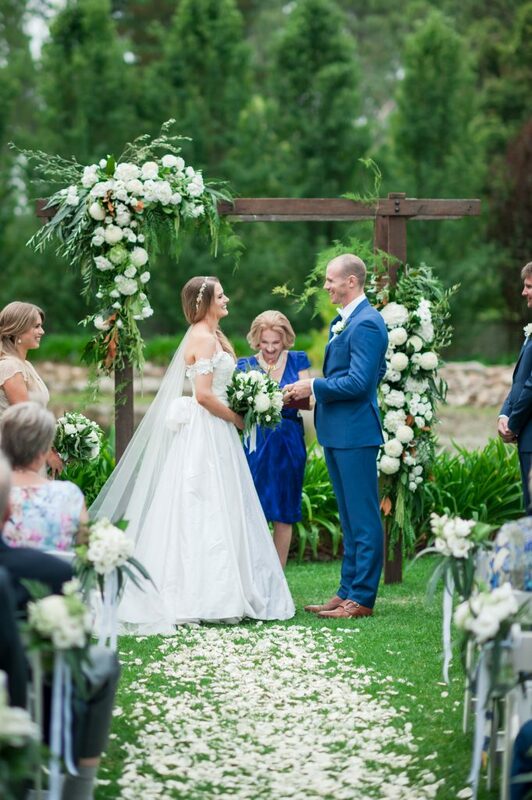 This gorgeous couple said their ‘I do’s’ at the equally gorgeous Glen Ewin Estate, Gate House. Let’s have a closer look at their wedding flowers with thanks to stunning images from the very talented Jade Norwood. INDUSTRIAL Bridal Bouquet “Ashlea” consisting of white hydrangea, freesia, scabiosa, pom pom chrysanthemums, snow berry, veronica, blue gum foliage and fern. Image by Jade Norwood. Ashlea ordered her flowers early through my online store as she knew suppliers book up quickly in March. 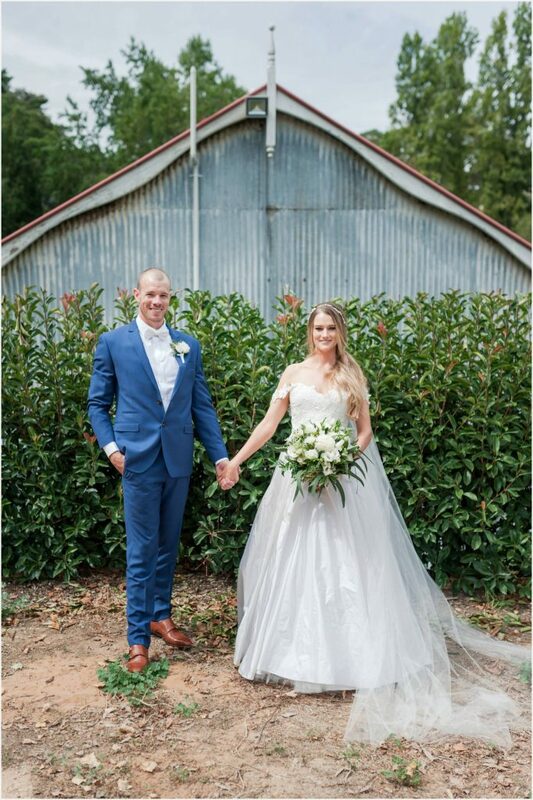 She was lovely to work with, placing her trust in me by choosing ‘seasonal florist choice’, allowing me to use my knowledge and experience and find the most beautiful blooms available on her wedding day. And oh, how I did! I used seasonal white flowers and lots and lots of lush green textured foliage. Her textured Industrial Bridal Bouquet consisted of white hydrangea, freesia, scabiosa, pom pom chrysanthemums, snow berry, veronica, blue gum foliage and fern. 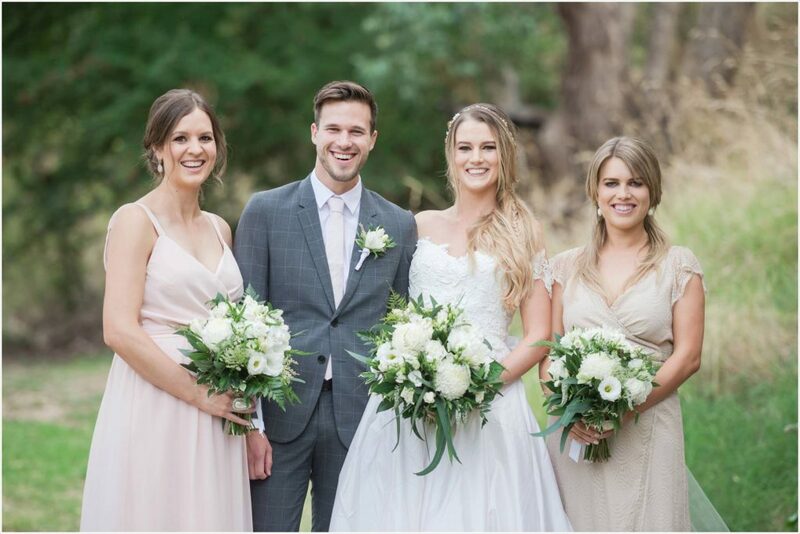 Her bridesmaids carried slightly smaller versions of the bridal bouquet and the groom and groomsmen wore white freesia buttonholes with beautiful textured green foliage to accent. INDUSTRIAL Bridesmaid Bouquets “Ashlea” consisting of white hydrangea, freesia, scabiosa, pom pom chrysanthemums, snow berry, veronica, blue gum foliage and fern. Image by Jade Norwood. My team and I loved creating the stunning garden ceremony arch, with big bursts of the same beautiful blooms seen throughout her wedding. The aisle was lined with fresh rose petals and guest chairs were adorned with matching posies. With the lake in the background, it was a perfect setting to exchange vows. GARDEN Ceremony Arch. Image by Jade Norwood. Guests were treated to a fabulous welcome sign by Willow and Ink, adorned with a matching Industrial Sign Spray. 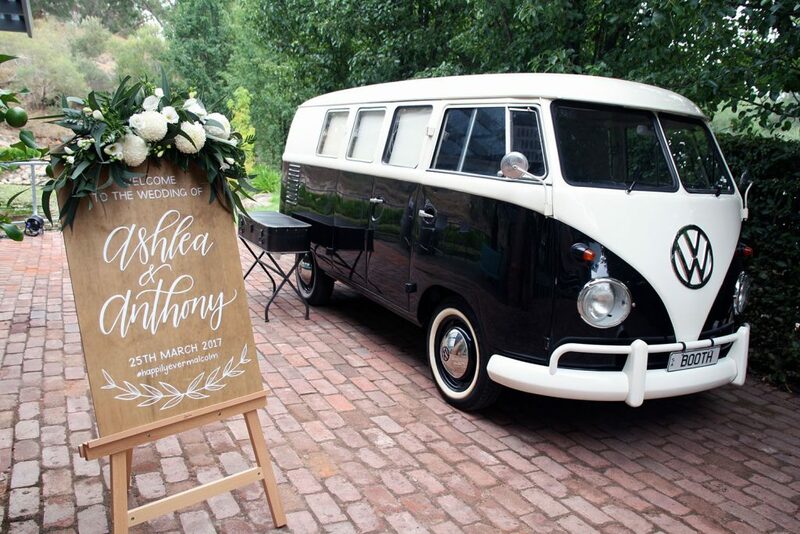 This stood proudly next to the cutest photobooth I have ever seen, a vintage black and white VW Van by Snapple Photobooths. INDUSTRIAL Sign Spray consisting of white lisianthus, freesia, pom pom chrysanthemums, blue gum foliage and fern. 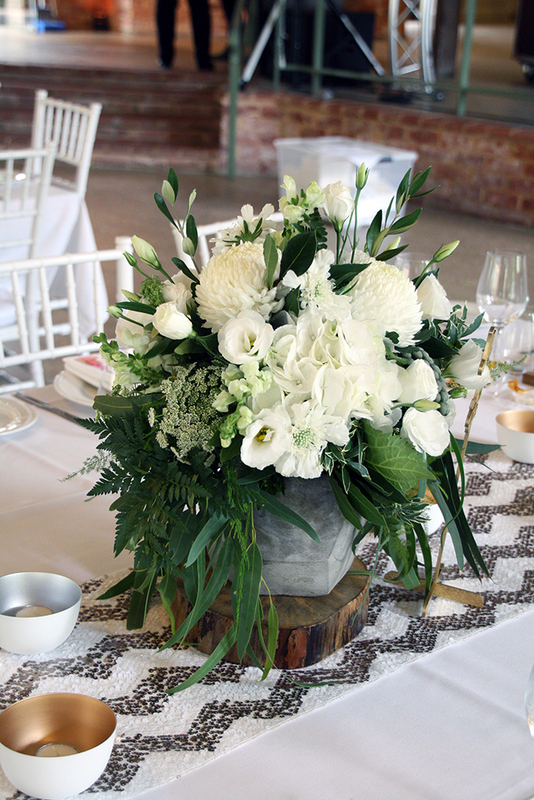 Image by The White Orchid Floral Design. Inside the reception space an Industrial Hanging Floral Installation gave a ‘wow factor’ moment over the bridal table. 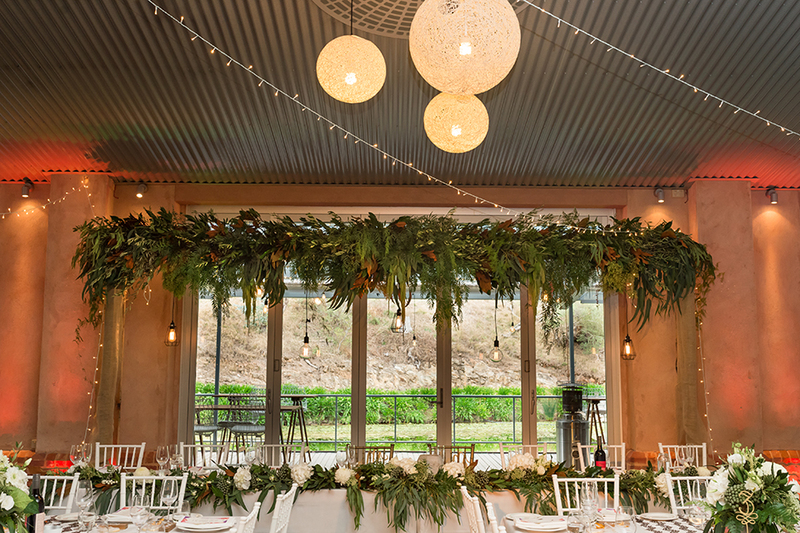 There were so many divine types of foliage used in this large scale design including magnolia, olive, peppercorn, eucalypt and green ferns. With beautiful lighting scattered throughout by the bride’s family business Central Audio Business. INDUSTRIAL Rectangle Hanging Installation consisting of all mixed textured foliage and fern. Image by Jade Norwood. To compliment an Industrial Foliage/Floral Table Garland ran the full length of the bridal table also. Guests tables were created in our Concrete Geo Vessels and created a cohesive overall look and style in the Gate House reception space. INDUSTRIAL Concrete Geo Vessel consisting of seasonal white blooms and textured foliages and ferns. 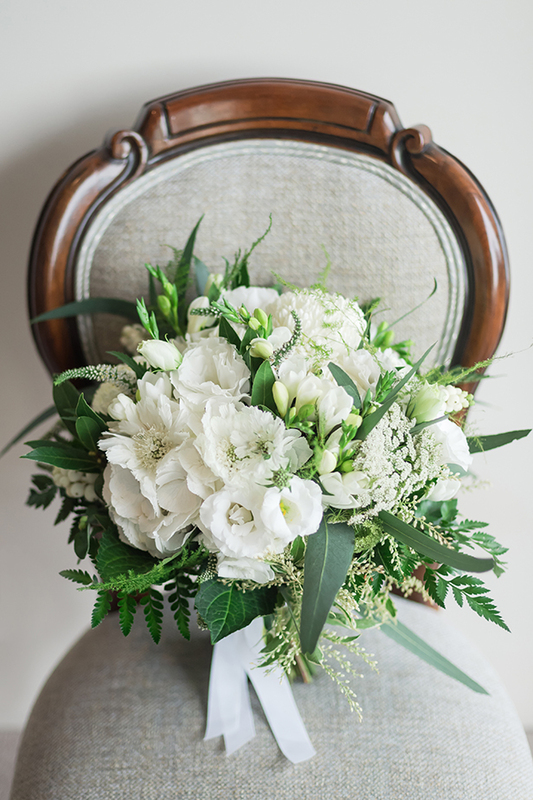 Image by The White Orchid Floral Design. 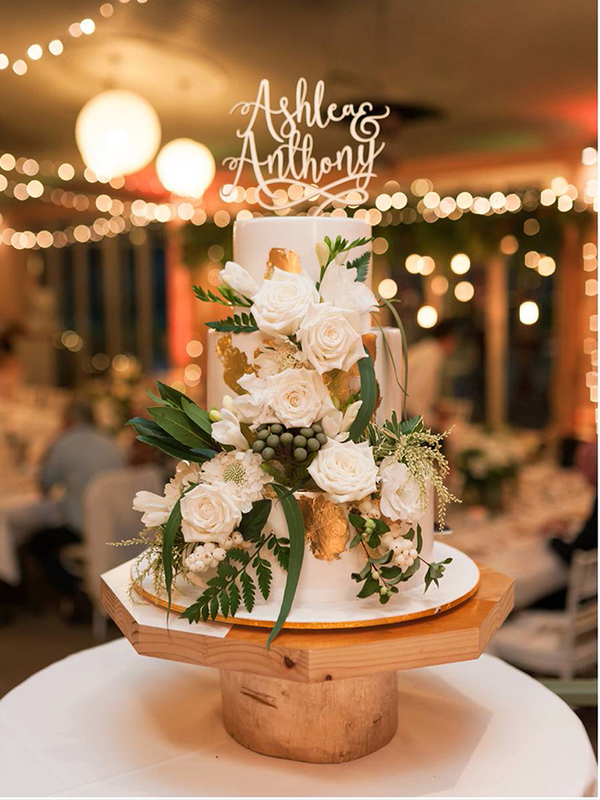 Gold accents were seen throughout the styling and Heidelberg Cakes created a fabulous three tier cake adding matching flowers and foliage to their creation. INDUSTRIAL Cake Flowers Image by Jade Norwood.